Well, as you may have guessed from the lack of recent blog activity- school has started up again and has been keeping me busy as ever. This means that I’ve had a lot less time for cooking, let alone writing about cooking. But I’m still going to try to keep up with fraises et tartines throughout the school year. I enjoy waking up on Saturdays, sitting down with my cup of coffee and writing. It’s a nice break from the type of academic writing and reading that I have to do for school. Just as celebratory side note- this is my very last semester of coursework for my masters! In the spring, I get to start my student teaching, and then go into an externship in a hospital setting next fall. Reminding myself that this is the final push to the end of this race is really going to get me through these last months of student-hood. Okay enough about school. I have been planning on sharing the secrets of crepe-making with you for some time now, so that is what I plan to do today. Really, it’s not a big secret and not nearly as complicated as people think. But it never fails to impress people when I show up with a plate of freshly made crepes or when I make them while people are over for dinner and show off my crepe-flipping skills (the one-handed, no spatula flip does take some practice, but anyone can get it). Another common misconception about crepes is that they’re only for dessert. Actually, in France they have savory crepes (called gallettes) and sweet crepes. The gallettes have buckwheat flour in the batter and are traditionally served with egg, gruyere cheese and ham, but can be made with many different flavor combinations. They’re kind of like omelettes where the classic is ham and cheese, but restaurants have branched off to different “themes” like the southwestern or the californian omelette. My favorite is still the classic, but I have tried others that are tasty. One more thing before I go into the recipe- I can’t count the number of times people have suggested having crepes for breakfast. I suppose this comes from the perception that a crepe is a french “pancake,” but I personally have never eaten a crepe for breakfast. I know there are restaurants in France that serve them for breakfast (at least I saw one in Arles), but I would guess that these cater to tourists. The French don’t tend to go for super sweet things for breakfast and usually stick with the traditional tartine with butter, maybe some jam and a cafe au lait. Occasionally they might live it up and have a croissant beurre instead of the tartine, but I’ve never heard of whipping up a crepe for breakfast. I could be wrong, but it’s not something we did in my house growing up. Mix all of these ingredients together and let the batter sit in the refrigerator for at least 1 hour before using it. If the batter seems too thick when you take it out add a little bit of water. The batter should be pretty thin so that it spreads easily when you pour it onto the pan. The first couple of times you make them, it might be difficult to gauge how thick or thin the batter should be, but you’ll get the hang of it after a few times and know how much water to add. 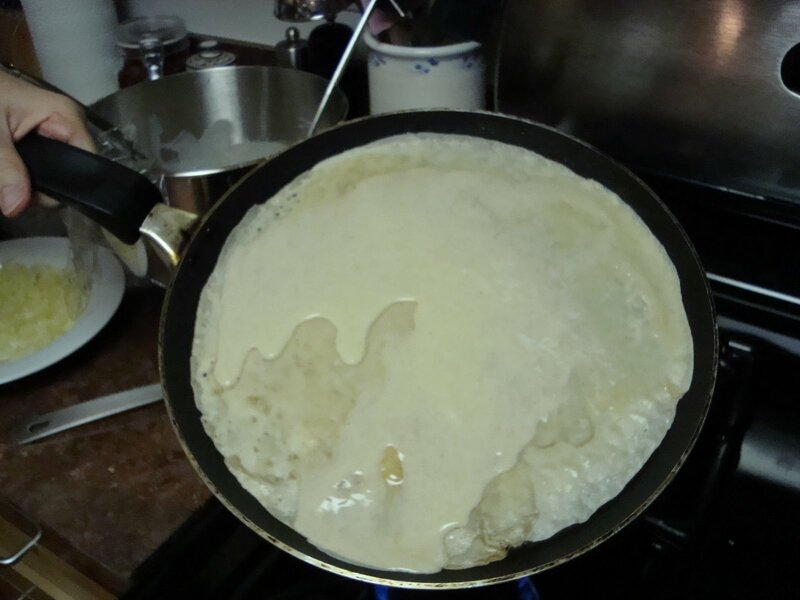 When you make the crepes, use a pan that’s very flat. Heat the pan to medium heat, and make sure that it’s nice and hot before you begin. Not waiting long enough for the pan to heat up will result in a thick mess that you will have to throw away, so just be patient. Grease the pan with a little butter, a bit of oil on a paper towel, or with cooking spray. Growing up we always used oil or butter on a paper towel, but now I use canola oil spray. Either one works well. Now here comes the tricky part- Use a ladel to pour some batter onto the pan. Right after pouring the batter, pick up the pan and tilt it in all different directions to distribute the batter. If there isn’t enough batter to cover the whole pan, add a small amount of batter to the empty areas and keep moving the pan around to distribute the batter. Once the pan is fully covered, set it back down on the burner and let it cook for a few minutes. You’ll notice the sides of the crepe begin to look brown and crispy. 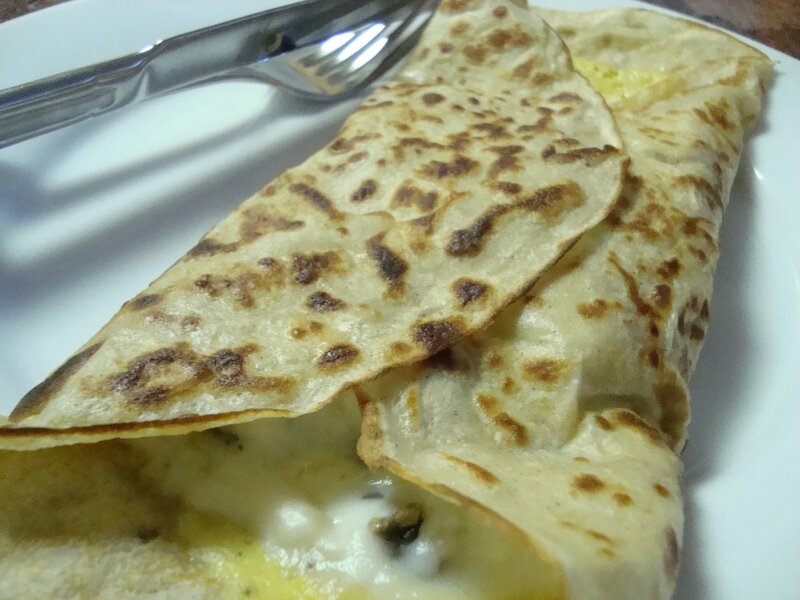 Slide a spatula underneath the sides of the crepe and work your way around it. Then, using the spatula, flip the crepe. Add whatever ingredients you’re going to use. 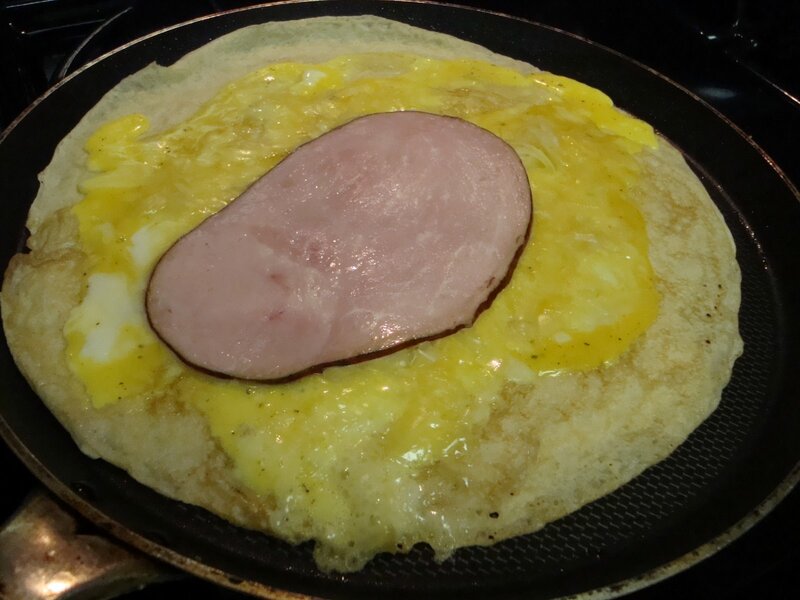 If you’re making a traditional one, put the egg on first (that you’ve already scrambled a bit in a bowl), then the grated cheese and then the ham. Let the egg cook and cheese melt for a minute or so. When it’s done, fold the crepe up and slide it onto a plate. Gallettes are best served with some hard apple cider. 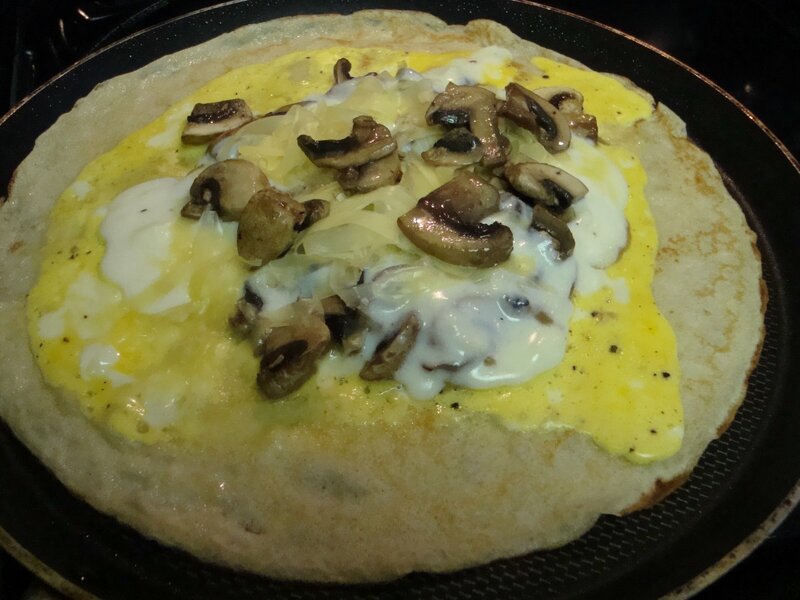 Below I have a gallette with egg, mushrooms, bechamel sauce and gruyere. It was delicious, and a great option for vegetarians! This entry was posted in easy cooking, french on September 6, 2008 by seedsowingmama.